Meet the new coach, same as the old coach. Seth Emerson introduces us to Will Friend. Dramatic changes are not in store, it seems. It doesn’t sound like there will be any major overhaul of how things are taught and done on the line. 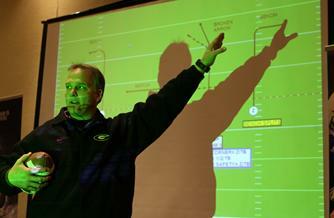 Friend, a protégé of UAB head coach and former Georgia o-line coach Neil Callaway, said Callaway and Stacy Searels used the same basic terminology. As a blogger hoping to hear more on the zombie avoidance front, this can only come as very good news. Schlabach is reporting that Washaun Ealey has been indefinitely suspended. It may be time to start buying into all that “boys, there’s a new sheriff in town” talk. UPDATE: Ealey confirms my header. Washaun Ealey has confirmed to me that he is suspended from team activities. He said he wants to stay at UGA, but is unsure of his future. I hope he gets a handle on things. The most significant statement I heard on National Signing Day at UGA had nothing to do with this dreamy 2011 recruiting class. It was when someone asked offensive coordinator Mike Bobo about current players in the offseason conditioning program being conducted by Joe Tereshinski. That’s the kind of quote you jot down and remember later, because it was honest. In speaking to media, college players will often just generate clean platitudes about all areas of the program because they think that’s what is expected of them, lest anyone be seen as a malcontent publicly. But in this case, that’s not what fans want to hear. Basically, they want to know that Georgia’s players hate this offseason program, dread it on a daily basis and just want it to be over. So Bobo’s statement represented the first real response, in my opinion, that lets outsiders begin to think this Van Halanger-Tereshinski switch is working. This isn’t going to be an easy offseason, folks. Are schools getting better at gaming the NCAA’s rules system? Among other trends, the NCAA found a “lack of institutional control” at 14 universities from 2001-2010, down sharply from 31 from 1991-2000. “Lack of institutional control” is among the more serious NCAA rules violations, because it suggests that the college in question did not have adequate policies and practices in place to prevent violations and did not sufficiently oversee rules compliance. The 2000s, however, saw a near-quadrupling — to 23, from six in the 1990s — of the number of colleges found guilty of “failure to monitor,” suggesting that more institutions had proper policies and procedures in place but used them insufficiently. The infractions committee used what have historically been its most serious penalties — bans on appearing on television and on appearing in the postseason — much less frequently in the last decade than in the 1990s. Just six Football Bowl Subdivision programs had teams barred from the playoffs in their sports during the 2000s, down from 31 in the 1990s. And no FBS teams were barred from appearing on television from 2001-2010, while three were from 1991-2000. So while major infractions over the past decade maintained the same pace as they did in the 1990s, the NCAA categorized them more mildly (the “didn’t know” defense rears its head again) and punished less severely when they occurred. You can begin to understand why ADs like Mike Hamilton survive the transgressions of the Pearls and Kiffins of the college athletics world. Nobody expects to pay much of a price for them. Negative Grohmentum hits the recruiting trail. In a piece about Virginia head coach Mike London’s successful efforts at recruiting this year, there are several observations about his predecessor and current Georgia Tech defensive coordinator Al Groh that should warm the cockles of the hearts of the Jacket faithful. … Fueling the anger in the final weeks of the 2009 season was the decision to burn the redshirts of 14 freshmen. To many high school coaches, the move looked like Groh was mortgaging the future of the program in a desperate attempt to win a few more games and save his job. That frustration was replaced with optimism when London, who previously served as an assistant at Virginia before becoming head coach at Richmond, arrived. The new coach and his staff began calling in-state coaches immediately. Perhaps nothing symbolized the shift as much as Fork Union Military Academy coach John Shuman’s presence at London’s introductory press conference. Fork Union, located just outside Charlottesville, produces Division I prospects on an annual basis, but relations between Virginia and the prep school had essentially come to an end under Groh after Virginia passed on multiple Fork Union players, including Shuman’s son Ryan, who became a three-year starter at Virginia Tech. Nothing like building long-term relationships. I guess waving Super Bowl rings around doesn’t get you as far as it used to. If Richt, Garner, Bobo et al. can’t clean Tech’s clock recruiting in state every year, we ought to sue them for recruiting malpractice. He’s gonna need a bigger lock. I’m always amused by the people who whine about this recruit or that one escaping the clutches of Mark Richt and agreeing to play for another SEC school. Why, oh why, the cry goes out, can’t Georgia put a fence up around the state and keep everyone else out? Well, because the math is daunting. As of right now, 736 high school seniors in Georgia have signed some sort of grant-in-aid to play college football. That’s according to numbers provided to The Atlanta Journal-Constitution by high school historian and resident “numbers junkie” Steve Slay. Included in that number are 183 players who signed on with Football Bowl Subdivision (FBS, formerly known as Division I) schools. Amazingly, those numbers are slightly down from last year’s totals. There’s a lot of talent produced in this state and there are only two in-state D-1 schools available to harvest it. That pretty much equates to a standing invitation for a lot of other schools to come in and take a shot at farming Georgia high schools. If Georgia signs the bulk of those it targets, that’s all Richt’s really got control over. Last Saturday was a pretty busy day for Georgia’s head coach. He was waiting to find out if John Jenkins would commit to his program and was immersed in a job search for two new assistant coaches. With all of that on his plate, he found himself in Long Island conducting an instructional clinic for coaches. Why? Quite simply, because business is business. And when Nike says jump, the proper response is “how high?”.